Light: Seeing the signs that you’ve reached your limits. Paying attention to what your body is trying to tell you. Giving in to the need for rest and renewal. Acknowledging that you’ve hit bottom. Committing to a turnaround. Knowing the worst is over. Shadow: Accepting defeat prematurely. Driving yourself to total exhaustion, especially mentally. Experiencing a mental breakdown. Obsessing on a problem to the breaking point. Giving up. Refusing to move from thought to action. Deeply unhealthy thoughts. Story: The Main Character must acknowledge that all is apparently lost. Relationships. Preserving a relationship or friendship shouldn’t require self-destruction. There’s a strong possibility it’s time to let this one go. Examine the logic you’re using to justify maintaining this connection. A healthy relationship produces peace, not insanity. Work. Know when to say when. Continuing to take on more work and more responsibility is not the answer here. Be honest about your limits. If they’ve been exceeded, ask for relief. Diverting some of the work may mean eating some crow, but beats a complete systems failure later on. Spirituality. It’s hard to keep your eyes on heaven when you’re face-down on the ground. When darkness overwhelms us, we may be tempted to abandon Spirit entirely. Finding just one thing to be thankful for, though, may provide you with the key to turning things around. Personal Growth. Failure is a cruel but powerful teacher. When possible, make corrections before hitting bottom. If that time has passed, the mature thing to do is accept consequences, resolve to do better, and start the process of making amends. As they say: live one day at a time. Fortune Telling. Disaster. Put off plans and do not take action until omens are better. When? Between June 11th and June 20th. The Human Pincushion. 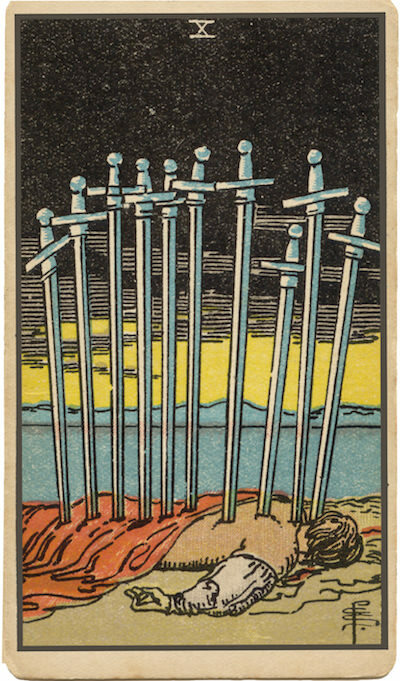 Optimistic users of the RWS claim the Swords on this card pierce the pitiful figure’s charkas, yielding enlightenment through trial. Other decks show the victim face-up, suggesting the additional agony of seeing a bad situation coming. In your situation, is there a way to extract a life lesson from the trial you’re now facing? If so, what would that lesson be? Dark Skies. RWS-inspired decks often depict a sunset (or sunrise) in the background of this card, suggesting that a change of some kind is at hand. How might your current situation contain the seeds of a turnaround? The End of Logic. Numerology suggests the Ten is the point at which fullness has been exceeded, and the energy of the suit becomes spoiled and over-extended. Here, endless deliberation and over-thinking have exhausted all possibilities for growth. It’s time to try another approach. The Marseilles Image. Two crossed Swords pierce the eight curved blades, producing a dramatic image of mental excess. At this point, any further debate (the two Swords) will do little more than shred the mental work (the eight Swords) completed so far. What are the signs that the time for debate is over? How can you tell when interest has given way to obsession? When your own limits are reached, where can you turn for aid?